On 2/26, Apple updated their entire MacBook line of laptops with better and faster hardware. I expected that announcement some time this month. I think they surprised most people by making it in February. I’ve been waiting to purchase a MacBook Pro for some time, and with these latest updates to the hardware, Apple has made their laptops irresistible. Not only have they gotten faster processors, bigger hard drives and more video memory, but they also inherited the multi-touch trackpad from the MacBook Air, which should make it easier for me to work with my photos. I also know about Hackintoshes, but I’d rather stay on the legal side of things. I hope that at some point, Apple will decide to make OS X available on non-Apple hardware that meets stringent hardware compatibility tests, but for now, I can only get OS X on Apple computers. I’m looking at the 15″ MBP, and it’s quite possibly the best laptop on the market in that size, barring a few issues that I’ll outline below. First, here’s the configuration that I plan to get. I’m very pleased with Apple’s new pricing. I can get this configuration for about $300 less than a comparable high-end config (2.4GHz/2GB RAM/200GB drive) on the previous 15″ MBP. Now here are the things that bug me. I don’t know why Apple still insists on DVI connections when HDMI ports are much smaller and carry both video and audio. 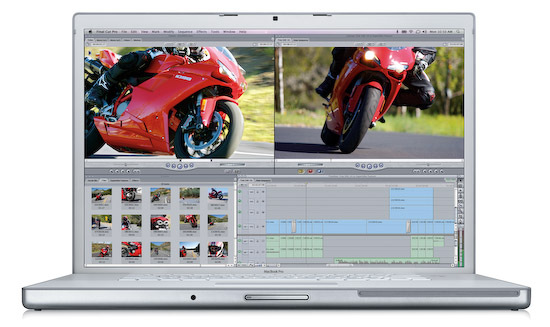 The MBP would be perfect with an HDMI port, and I would be able to hook it directly to an HDTV and play movies with full digital video and audio directly from the laptop, without needing to connect both a bulky DVI cable and a separate audio cable. This sort of thing just doesn’t go with Apple’s design philosophy. An HDMI connection means less clutter and it’s simpler to use than DVI. Why not go to it? Here’s a test for you. If you already have an MBP, press down on the center of the top lid (Apple logo or its immediate area) and see how much it caves in. That’s just not strong enough. The aluminum enclosure is too thin, and it’s not bolstered by cushioning underneath. It needs some support under there. It’ll easily dent and possibly damage the LCD if pressed or bumped lightly against something. 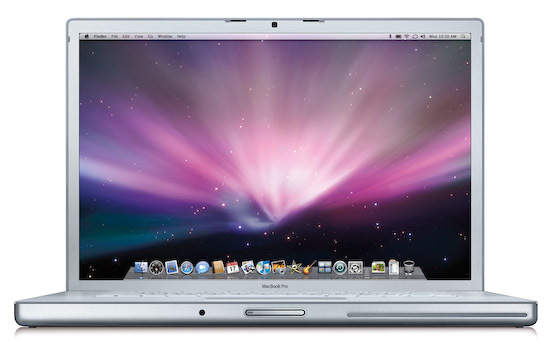 I had an aluminum 17″ G4 PowerBook a couple of years back, and I remember its top lid being sturdier than the MBP’s. Another problem caused by the flimsy top lid is that the keyboard ends up scratching the LCD when the MBP is transported. The simple act of holding the laptop under your arm or in your hand, or putting it in a case and hauling it around will put pressure on the lid and rub the LCD against the keyboard. Over time, the keys will leave scratches on the LCD. That’s not right. I’d rather not carry around a felt cloth and put it between the screen and the keyboard, like I’ve seen some people do. The lid should be made sturdier, and either the display or the keyboard should be sunk lower in the laptop frame, so there’s less likelihood of them rubbing together. It looks like most, if not all laptops, have 6-bit displays, with varying qualities of dithering engines and color capabilities. So while it’s unfortunate that Apple can’t pull away from the pack on this one and offer 8-bit color in its laptop displays, at least the MacBook Pro display is great to look at for extended periods of time and does a decent job of displaying colors properly, which is more than I can say about most laptop displays. Other than the few things described above, I can’t find any faults with the new MBP laptops, and look forward (eagerly) to getting my very own soon. that macbook look damn decent and expensive too. It sure looks tempting. Like all laptops, they have Achilles heel. It would be nice if they added blu-ray burners and players and optional HDMI ports to their products. also make their macbook pro more sturdier. to give MS some competition.